Anywho…this is so light and breezy and yet makes me feel dressed up. Love it! 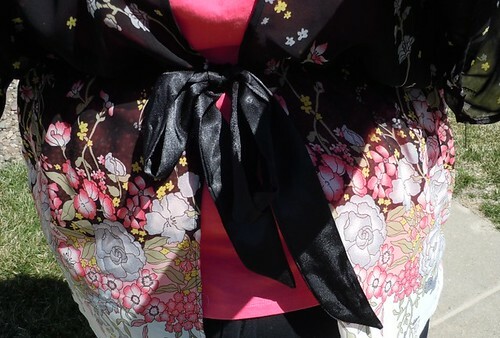 But I think I am going to take the flowery top back and get a smaller size as it looks too big for me. Yeah for losing weight!! I adore this necklace. When my maternal grandparents retired in the late 70s they first moved to Arizona where they proceeded to do a lot of rock and mineral hunting. My grandfather then turned a number of those minerals and gems into jewelry in the 1980s. I have several pieces, most more elaborate than this, but this one is probably one of my favorites because it’s just so freaking simple – a very large Apache Tear glued to a fastener and strung on a chain. I inherited it with a bunch of other stuff from my grandmother in 1995. I recently cleaned out my jewelry box and came across it. Usually stuff I can’t bear to part with but don’t want to wear goes into there to die as I’m a visual dresser – gotta see it to decide if I am going to wear it. 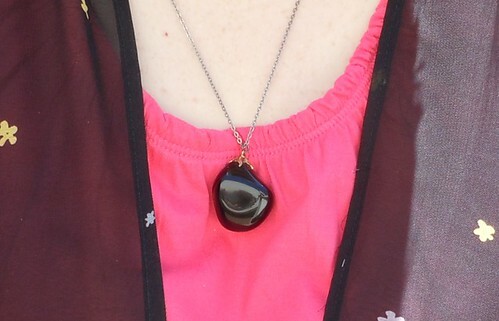 So I’ve pulled it out and hung it with the rest of my jewelry as I’d like to wear it more. What a statement!